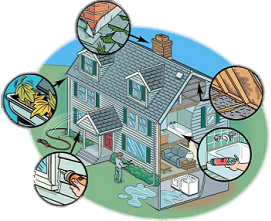 Mike is a Virginia and ASHI (American Society of Home Inspectors) certified Home Inspector. He is committed to providing inspections that comply with the ASHI Standards of Practice, and conducting business according to the ASHI Code of Ethics. He also firmly believes that a professional home inspector should provide a well written concise and easy to understand inspection report. Professionalism throughout the process is his goal. Purchasing a home is one of the biggest single investments most of us make in our lifetime. This makes the home inspection a priceless service – contingent upon the skills of the inspector. Inspection Services of Central Virginia LLC provides quality home inspections, light commercial building inspections and energy audits in Richmond Virginia and the surrounding counties. Home inspector, Michael G. Bryan, wishes to assist you through his twenty-two years of “hands on” construction experience and twenty-three years of inspecting experience. He has inspected over 16,000 homes and commercial buildings to date. If you have a questions or concerns regarding a building, Inspection Services of Central Virginia LLC can help you find answers. Please feel free to contact us directly by telephone at (804)744-0380 or use the contact us form. Don’t see an inspection service that you need? Fill out the contact form with your questions. Serving Richmond, Virginia and Surrounding Counties. Schedule an inspection right now online! Proudly serving Central Virginia through Residential and Commercial Building Inspections.